Be continuously inspired by Adam’s Taliaferro memorable walk on to Beaver Stadium! 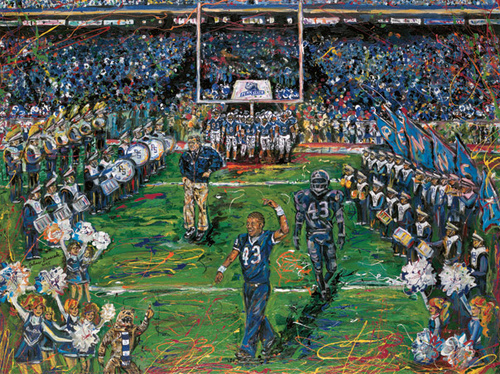 This limited edition poster represents the uplifting moment when Taliaferro led the Penn State Nittany Lions football team onto Beaver Stadium’s field for the first game of the 2001 season. In late 2000, after only his fifth game as a Freshman, Taliaferro sustained a career-ending spinal cord injury. Unable to control his fall after a tackle, the crown of his helmet hit the turf and his body rolled awkwardly over his neck. Taliaferro was paralyzed from the neck down on that hit. He had to be flown directly to a hospital in Ohio for emergency surgery. He was then airlifted to Philadelphia, PA to continue the road to recovery. Miraculously, after only 8 months of rehab, Taliaferro began to walk again. He returned to PSU less than a year later to finish his degree, and he continued to be a part of the Football team as a student-assistant to Joe Paterno. 3,000 of these Limited Edition Prints by renowned artist Johno Prascak are available. The original painting still hangs at the Penn State Sports Museum. But these prints are signed by the artist and numbered, and printed on acid-free, museum-quality 100 lb. paper. 312 Sweet Cherry Ct. Hollidaysburg, PA 16648. Write “print” on the memo line. And be sure to include your mailing address.